The first stop on our trip to India was Mumbai. 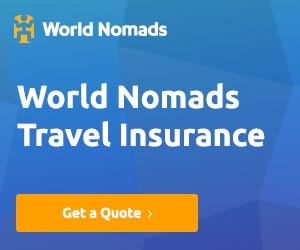 I’d done some research before arriving and found other travel blogs and TripAdvisor great resources for ideas on what to see and do whilst in Mumbai. 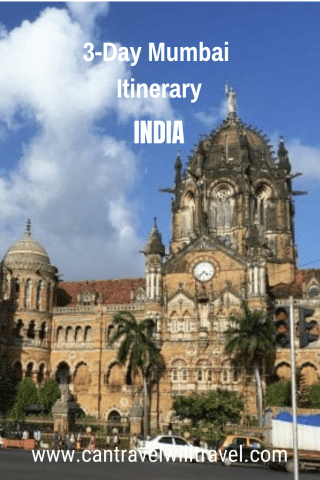 Although useful, many were out of date so here’s an up to date 3-day Mumbai itinerary based on our experience. Situated at the tip of Apollo’s Blunder in South Mumbai, the Gateway of India is a great place to start your sightseeing in Mumbai. The gateway was built in 1924, in memorial to King George V of England, who landed in India at the same place in 1911. The last British troops also departed through this gateway after Indian Independence in 1948. If you visit at peak times be wary of the many street vendors and photographers that hang around selling their good and services. Take special care if, like us your visit coincides with a festival. We were there during the Ganesh Festival (Ganesh Chaturthi), the Hindu festival celebrated in honour of the elephant-headed god, Ganesha. The whole area heaves with foreign and domestic tourists, so it’s important to take extra care of valuables and belongings. This is where you really see and feel the buzz of this lively city. It’s full of colonial buildings and established and more modern restaurants. It’s difficult to recommend any key things to see and do here. In my opinion the best approach is just to wander around and experience it for yourself. Be mindful of the crazy yellow and black taxi’s and noisy buses belching plumes of choking smoke. You’ll have fun navigating the sidewalks crowded with people going about their daily business and street hawkers selling their wares. 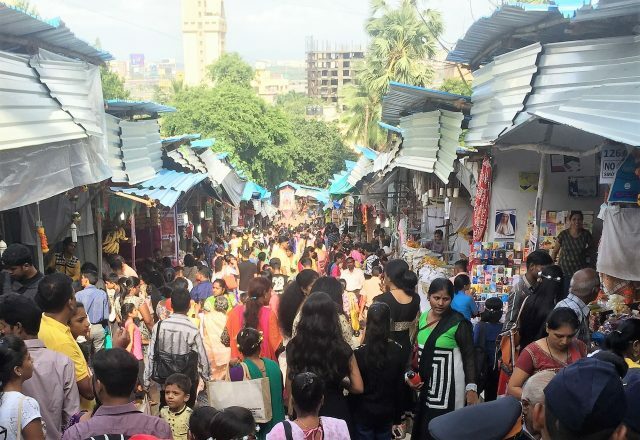 The streets are lined with shops and stalls selling a plethora of Indian handicrafts, clothes, jewellery and everything else you could think of. It’s fun to explore these but try haggle prices down to what you’re prepared to pay. Remember though many of the vendors are poor so don’t be too ruthless. 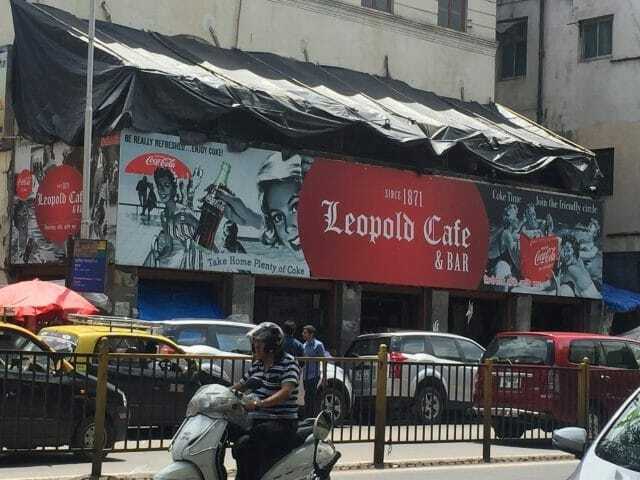 When you get hungry or thirsty be sure to pop into Leopold Cafe, one of the most established and famous cafes in Mumbai. It’s mentioned in the book Shantaram by Gregory David Roberts and was also the target of the 2008 terrorist shootings. It has cheap beer and tasty food in a lively atmosphere. Sassoon Docks are best visited early in the morning, around 6 – 7 am, when it’s at it’s busiest and most interesting. It’s said to be a hive of colourful activity as the boats bring the fish in and the Koli women in their traditional dress bustle about processing and packing the fish ready for their next destination. Unfortunately, we didn’t make it to the docks until later in the day. By that time the fishermen had long since landed their fishy bounty and sent it on its way. Despite our tardiness, there was still lots to be seen. Fishermen were repairing nets, and men and women jostled and bartered loudly over the remains of the days catch. If you visit I’d recommend wearing closed in shoes to avoid getting slimy fishy water between your toes. Also breathe through your mouth as the smell isn’t for the faint hearted. Be aware too, that Koli women are not the most welcoming. They are likely to aggressively gesture you away if you try to photograph or talk to them. I’ve also heard that photos aren’t permitted unless previously agreed with the Mumbai Port Trust. I’m not sure how accurate that is though. 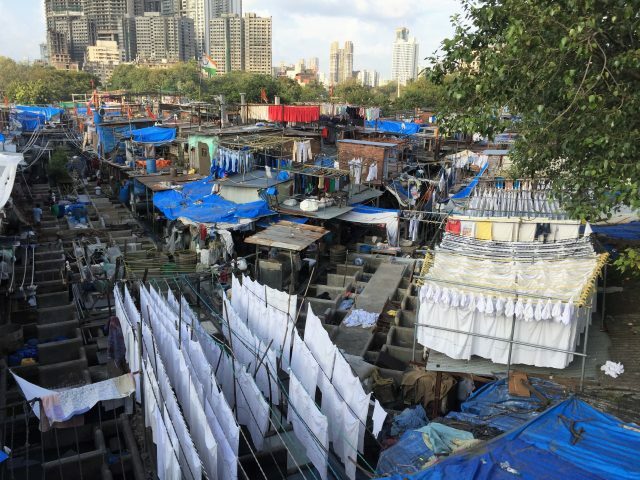 There are many slums in Mumbai and across India and it was a moral dilemma for us whether to visit or not. We decided against it as we didn’t agree with going on a guided tour viewing people living in the slums like “animals in a zoo”. We then actually stumbled into the smaller Apollo Bandar Slum completely by accident, without even realising. This slum overlooks Sasson Docks and Gateway to India. It’s surrounded, by several small open-air markets selling all kinds of fresh and live produce, and household goods. As far as I’m aware this isn’t visited by guided tour groups like the Dharavi Slum is. This means it doesn’t have a stream of tourists walking through the streets. Initially, we found ourselves wandering around some small outside markets set up in some streets. It wasn’t until we ventured deeper down the alleyways we realised we’d wandered into the slum. At first, we felt uncomfortable and tried to work out the quickest way to leave without offending residents with our presence. However, it soon became clear though that no-one minded us being there. We were welcomed with smiles and waves from the adults and curious giggling and chattering from the children. Calls of “Hello, how are you?” and “What is your name” followed us. If you do go here, please be sure to treat it and it’s people how you’d like be treated – with respect. Just walk around like you would in any other town and don’t stare and take photos (unless invited to of course). Formerly known as Victoria Terminus, after the English Queen Victoria, this station was renamed in 1996 to honour Chhatrapati Shivaji, the founder of the Mahratta empire. It serves both suburban and long distance trains and is always a busy bustling place to visit. 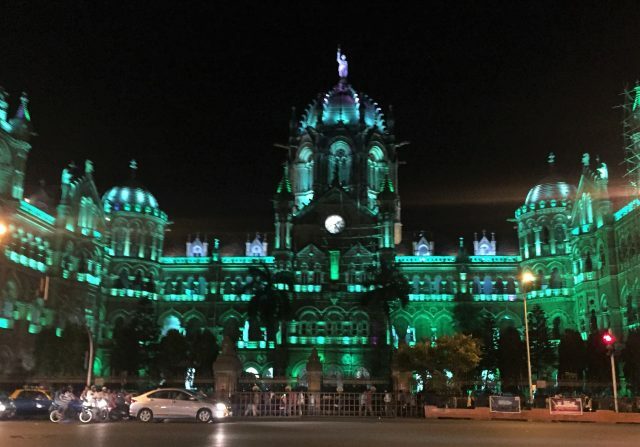 CST is a great colonial building and a UNESCO World Heritage Site, with Victorian-Gothic style architecture. Its entrance is framed by two columns topped with a lion to represent England and a tiger to represent India. There are also some beautiful peacock lattices on the walls. It’s definitely worth a visit and if you’re feeling adventurous jump on one of the local trains. Also try to go past at night to as this building is especially eye-catching at night when it’s all lit up. Outside CST we naively let ourselves be talked into renting an air-conditioned taxi and ‘English speaking’ guide to take us round some of the other key sights. He charged us 1,500 rupees (£17.50) and asked for 800 rupees up front. As soon as he’d pocketed the cash he found us another dilapidated taxi with no air-con and a driver who didn’t speak a word of English. He told us he could no longer guide us himself as he was too busy, but this driver would take us and we should pay him 700 rupees at the end. Basically, we’d just conned out of 800 rupees…very annoying! 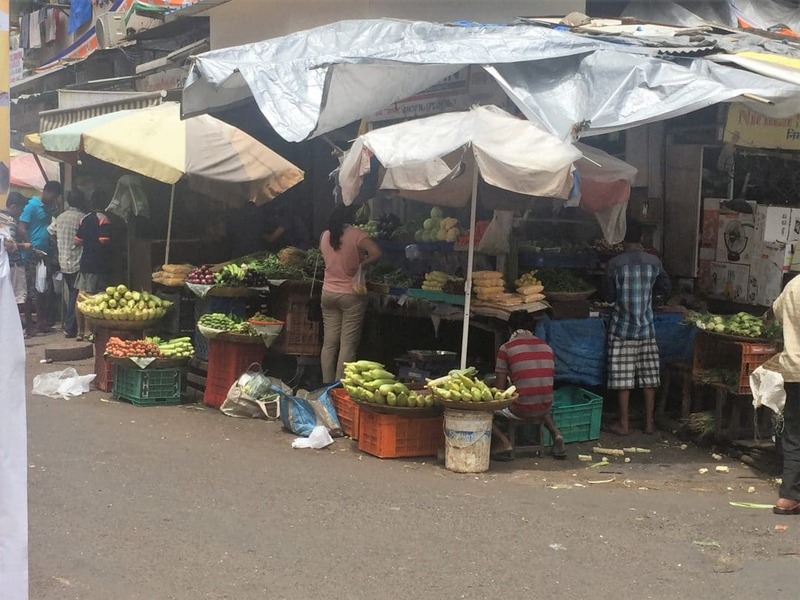 This busy market, just past CST was previously known as Crawford Market, the majority still refer to it as this. It’s housed in a large building resembling something from Victorian London. It’s said to be crammed full of vibrant stalls selling mainly fruit and vegetables. Unfortunately we were short on time so had to skip this and only got to view the building from the outside as we drove past. Referred to by many as the worlds largest outdoor laundry, this can be viewed from the bridge above it. It’s quite a sight, rows upon rows of stone washing pens, each with a flogging stone, where men wash tons of laundry everyday. The clean washing is then hung up to dry. The whites and coloureds flapping in the breeze present good photo opportunities. For a small price one of the locals will take you into the Ghat for a tour, but we chose not to. 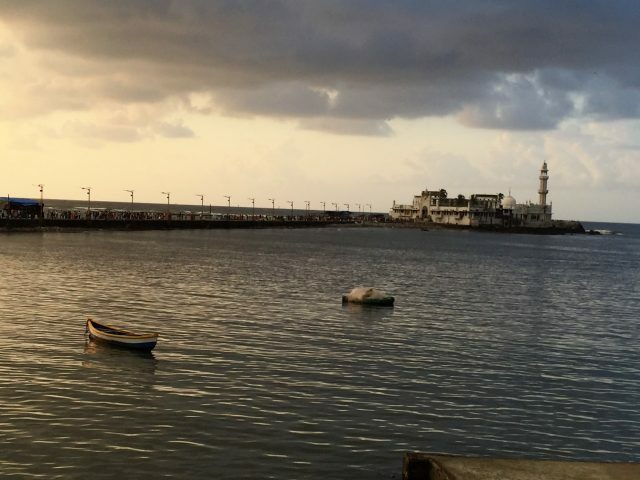 The Haji Ali Dargah is a mosque and tomb situated on an offshore islet in South Mumbai and is one of the most well-known landmarks of Mumbai. It can only be visited at low tide via a causeway from the mainland and from a distance it appears to float on the sea. For me one of the highlights was the walk from the road and down the causeway to reach the mosque. It’s only 5 feet wide and with no barriers either side it could be dangerous when crowded or slippery. There were many hawkers selling their wares such as food, soft drinks, scarves and prayer mats. Several beggars were also dotted about, but they weren’t pushy and left us alone after a firm “no sorry”. People of all religions are welcomed into the mosque which means it can get busy at times. Despite this, it’s a calm, peaceful place to visit and the whitewashed building itself is quite impressive. There’s also a nice view of Mumbai from behind the mosque. Our last stop of day 2 was Marine Drive, a 3.5km long boulevard in South Mumbai. A palm-lined promenade lays next to a 6 lane concrete road which runs along the coast around a natural semi-circle shaped bay. It links Nariman Point to Babulnath and Malabar Hill. At night when viewed from any elevated point along the drive the street lights give the illusion of a string of pearls. This is where it’s alternative name, the ‘Queens Necklace’ originates from. We enjoyed our early evening stroll here, it had a lovely atmosphere with people out walking, jogging and sitting on the promenade walls chatting and socialising. It seemed to be a favourite of young couples out for a romantic evening, there was lots of hand holding and canoodling going on. Following our rip off taxi tour the previous day we decided to find a metered taxi for the third days sightseeing of North Mumbai. We would have preferred to use a rickshaw but these are banned inside the Coloba area so taxi was the only option. We’d heard rave reviews about Pani Puri, Mumbai’s most popular street food dish, but weren’t quite ready to risk questionable hygiene of the street food. The solution was brunch at Elco Pani Puri Centre, the most popular Pani Puri house in Mumbai. ‘Puri’ is a thin, crisp hollow ball, made from flour and semolina. 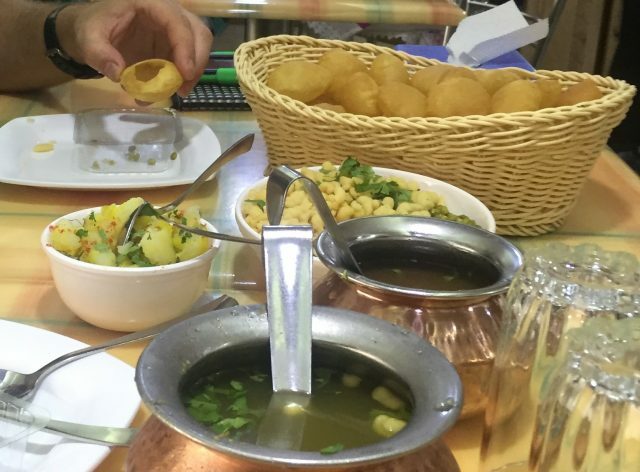 ‘Pani’ is side orders of potato, chickpeas, onions and spicy and sweet waters. There’s an art to putting these delicious morsels together. You punch a small hole in the top of each Puri with your thumb and fill it with Pani. The taste can be altered with either the spicy or sweet water or a combination of the two. Much to our fellow diner’s amusement Andy and I couldn’t get the hang of punching the hole in the top without completely crushing the Puri’s. We were making such a mess of it the waiter took pity of us and swiftly prepared each one for us. It was a fun and tasty food experience and definitely one of our favourite Indian dishes. I highly recommend not leaving Mumbai without giving it a try! 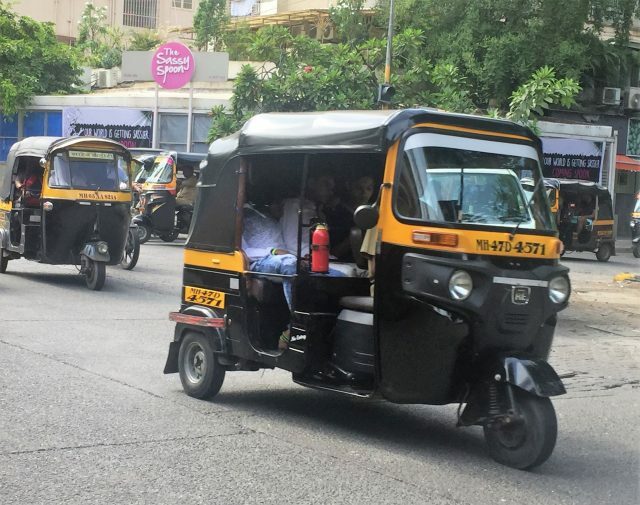 Once outside Mumbai the main mode of transport was yellow and black rickshaws, or ‘Bumblebee Rickshaws’ as I called them. They buzzed around everywhere, constantly meeping their horns to make their presence known.We flagged one of these rickshaws down and took a hair-raising ride to the expansive Juhu Beach in West Mumbai. 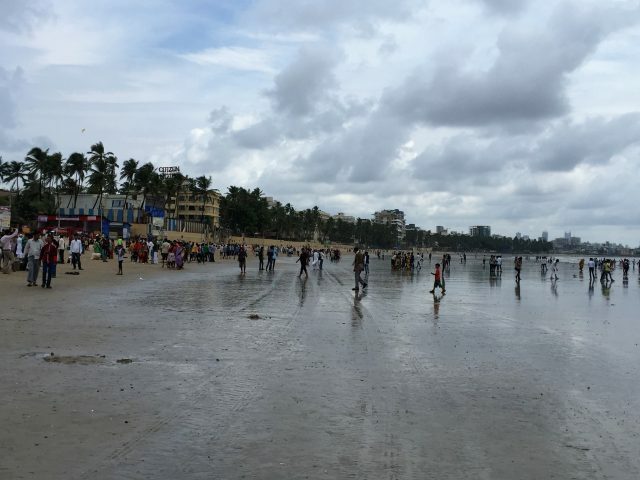 This beach sprawls for 6km and is a popular destination for domestic tourists. It’s not the cleanest of beaches but worth a visit just to people watch. Indians tend not to sunbathe and they swim fully clothed, but the beach was still full of families, couples and groups of friends taking part in all kinds of other activities. People strolled, jogged, played cricket and football, flew kites, and sat around socialising. Few other Westerners visit this beach so so be prepared for curious stares. We also got many requests for selfies, mainly from groups of young men. Mount Mary Church is high on a hill near Bandra, overlooking the Arabian Sea. It’s a lovely church and I’m sure usually a quiet serene place to visit. We decided to go there on a whim to on our way back to South Mumbai; we were so pleased we did. It just so happened that the annual week-long Bandra Fair was in full flow. This meant the church wasn’t such a calm place as I’m sure it normally is. For us, the fair made it for us as we’re not really into churches but love a local festival. 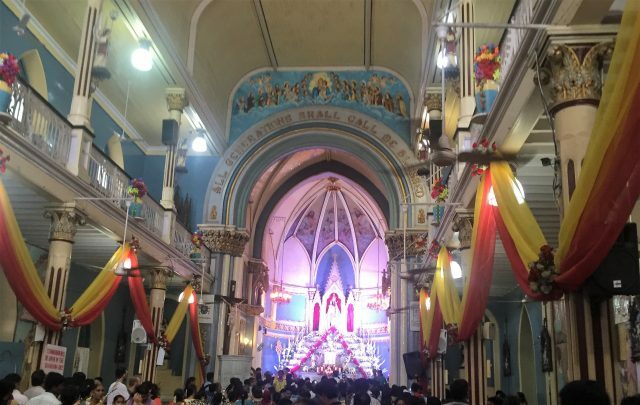 The whole area surrounding the church was festooned with bunting and was heaving with devotees and pilgrims. Apparently, tens of thousands visit each year. There were colourful stalls pitched up everywhere selling things like spices, sweets, candles, incense, floral offerings, and other religious objects. If you happen to be in Mumbai at the beginning of September be sure to check out Bandra Fair. The church is also worth a look if you’re there another time. If you’re wondering where to stay in Mumbai, there’s no need to worry. You’ll find a huge range of accommodation on offer to suit all budgets, styles and tastes. So that’s our 3-day Mumbai itinerary. Unfortunately, there were some things we wanted to do that we didn’t have time for or were unable to organise. Playing an extra part in a Bollywood film, the Hanging Gardens and Malabar Hill will have to wait until next time. 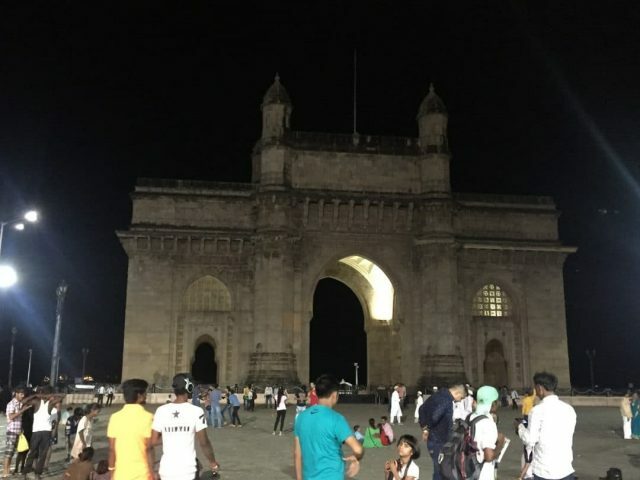 Should your time in Mumbai span longer than 3 days there are many other activities you could consider such as these offered by GetYourGuide. Remember when travelling in India as a woman that you need to consider carefully what you wear in order to be respectful of the culture. Paroma from Year of the Monkey has written a practical guide on what to wear in India for female tourists. 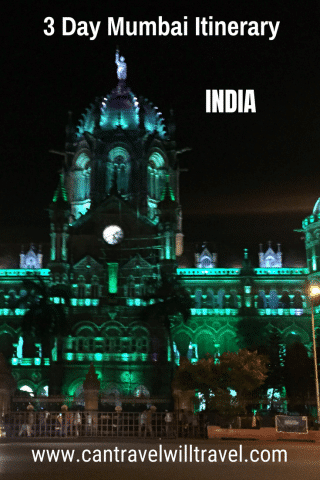 Have you been to Mumbai recently? If so have we missed anything important that may be good for others to add to their itinerary? I read Shantaram a few years ago and ever since have wanted to see Mumbai (ok, I also wanted to go before that). This was really interesting and I appreciated your comments about “slum tours” the concept of which has always made me uncomfortable. Yes – Shantaram definitely tempts you to visit for sure! Glad you found the post interesting. This is a good first timer itinerary. Maybe you should include something on watching a bollywood movie? That’s a lot of fun! Thanks – yes watching a Bollywood films a good idea – we were gutted we didn’t manage to get an extra role in a Bollywood film. That would have been fun!